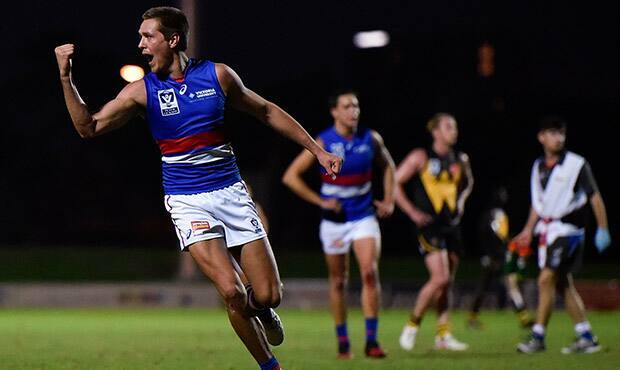 Footscray fought hard for their 51-point victory over the Werribee Tigers on Saturday night at VU Whitten Oval. With an even contribution, Werribee were unable to match Footscray's scoring power and defensive play. In an impressive victory for the Dogs, they led Werribee at every break. After leading 11 points at the end of the first quarter, the Dogs were industrious across the remainder of the game to extend the margin to 51 points at the final siren. Midfielder Caleb Daniel upset the Werribee Tigers at crucial points throughout the game, and was influential with 28 disposals and 8 tackles. Bailey Williams was an integral part of an impressive midfield performance, with a best on ground performance collecting 29 disposals and 12 marks. VFL listed Bulldog Nick Jamieson also had another strong game with 23 disposals, including14 handballs. Draftee Tim English won the ruck battle against the Werribee talls, and showed his athleticism around the ground with 17 disposals. Fellow draftee Fergus Greene proved to be incredibly efficient in front of goal, slotting five goals from 10 disposals through. Alongside Greene, there were four additional multiple goal kickers with Bailey Dale, Mitch Honeychurch, Nathan Mullenger-Mchugh and Jayden Foster all slotting two goals. Matthew Goodyear repeatedly made the Tigers nervous with an incredible 10 tackles throughout the game. Captain Jordan Russell was also a stand out with 17 disposals from defence. Footscray will face North Ballarat next Friday, April 14 at Victoria University Whitten Oval at 7pm.